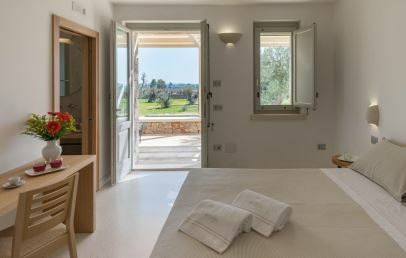 Tenuta Monticelli Bio Relais is set in the countryside outside Alezio, just 5 km from Gallipoli, surrounded by 6 hectares of olive tree groves. 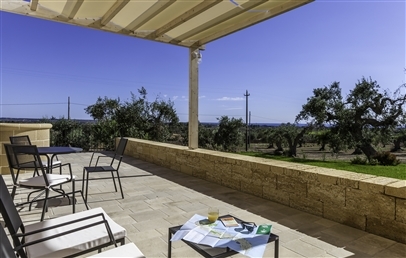 It is located 35 km from Porto Cesareo, 46 km from Santa Maria di Leuca, 43 km from Otranto, 42 km from Lecce and 85 km from Brindisi-Salento airport. 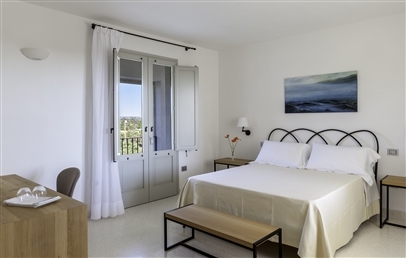 A former farmhouse dating back to the end of the 19th century, typical of the rural Salento region, the hotel has been renovated and injected with new life: today Tenuta Monticelli Bio Relais has been modernised and extended. The irresistibly charming old star vaults in the former farmhouse have remained intact, while the simplicity, the clean lines and the minimal furnishings are contemporary. 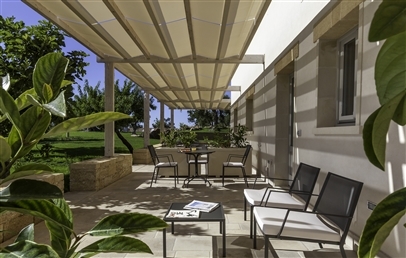 The outdoor bleached wood pergola is perfectly integrated into the design of the building. There is a unique enchanting light that illuminates the spaces inside the building. An elegant, simple and welcoming farmstead. 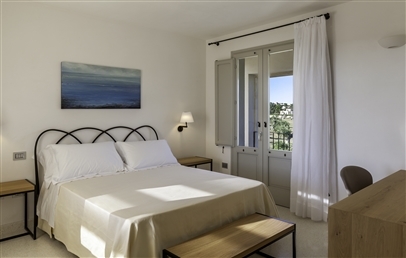 The Tenuta has in total 9 rooms, located either on the ground floor with patio or on the first floor with terrace (main building). 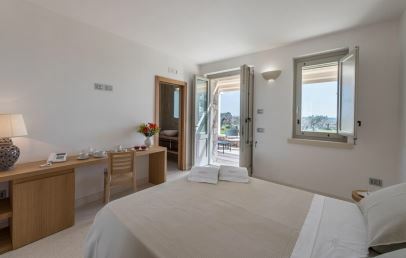 Four new rooms are located in two new annexe buildings surrounded by garden. 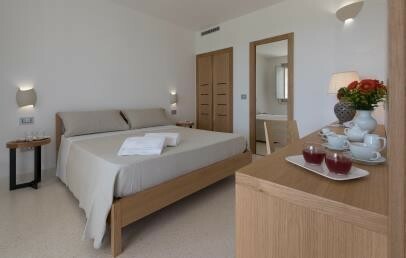 All rooms are nicely furnished with a lots of white and wooden elements, wrought iron beds or canopy beds. They all have a bathroom with shower, hairdryer, slipper, courtesy set, AC, TV, minibar, safety-box, complimentary Wi-Fi connection. Classic – approx. 20 sq.m., furnished patio. Superior Patio – approx. 21-26 sq.m., furnished patio, 2-3 people. Superior Terrace – approx. 24 sq.m. + furnished terrace with panoramic view and pool view. Deluxe Terrace – approx. 21 sq.m. + 80 sq.m. 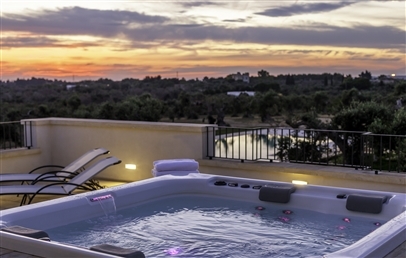 furnished terrace with a Teuco whirlpool for 4 p. and panoramic view. Superior Garden – approx. 16 sq.m., furnished patio, located in the new annexe building, 2-3 people. Trullo Garden – approx. 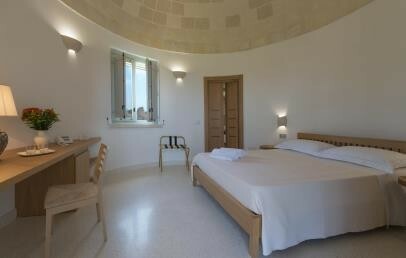 18 sq.m., circular room, furnished patio, located in the new annexe building, 2-3 people. Suite Family Garden – approx. 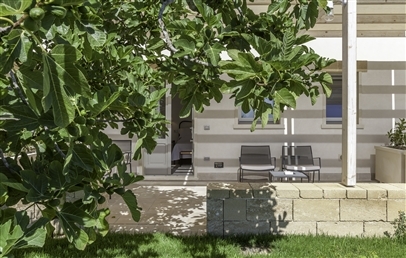 45 sq.m., composed of the Superior Garden and Trullo Garden room with interconnecting door. 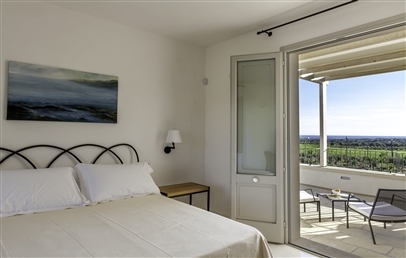 Tenuta Monticelli is 5 km from the bay of Gallipoli which opens to the south from Punta Pizzo. The Ionian coast offers numerous fine sand beaches (Punta della Suina, Lido Pizzo, Marina di Mancaversa, Torre Suda, Torre San Giovanni, Pescoluse, Torre Lapillo, Porto Cesareo, Punta Prosciutto), while the Adriatic side is generally more rocky (Otranto, Castro Marina, Santa Cesarea) featuring cliffs and a panoramic seafront road with breathtaking views over the Strait of Otranto. Breakfast is an abundance of traditional sweet and savoury local products as well as fresh fruit – some fruits picked directly from the hotel’s very own trees. Guests can start their day in the shade of the pergola with a typical Lecce cream or chocolate “pasticciotto”, delicious cakes and tarts made daily, dairy products and cheese from a local cheese factory, freshly-baked bread, fresh eggs, and figs picked from the trees next to the breakfast area. After a long day at the beach, guests can enjoy fruit salad and cold drinks. Each week in the outdoor oven/barbeque area, Tenuta Monticelli offers guests the opportunity to taste products from the organic garden alongside delicious freshly-caught grilled fish – accompanied by high quality wines from a well-known local wine cellar. 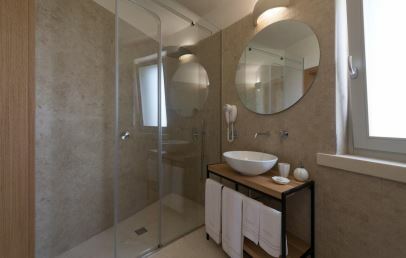 A calm ambience and a slow and relaxed rhythm of life are the defining characteristics of a stay at Tenuta Monticelli. Relax in one of the numerous secluded outdoor corners where you can lie back and read a good book surrounded by nature. Admire the stunning view of the sun setting over the sea accompanied by the sound of crickets and cicadas. The large pool with its panoramic sun deck and relaxation areas are open 24/7. 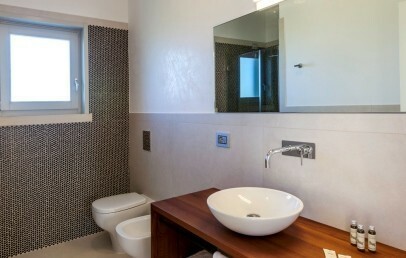 For more sporty guests, the hotel can organise walking or horse-riding excursions along trails that wind through centuries-old olive groves and unspoilt woods to explore the unique natural habitat of the Punta Pizzo Regional Natural Park and the island of Sant’Andrea, finally ending up on the beaches of Gallipoli. For food lovers and cookery enthusiasts, cooking and baking classes are available, where guests can learn to make traditional Salento dishes such as “sagne ncannulate con la ricotta forte” (long fresh pasta with ricotta cheese), or the typical cakes from Lecce – “pasticciotti” and “mostaccioli” and amaretto biscuits. 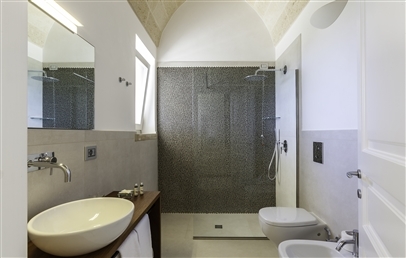 Guests can also borrow bicycles to go out and explore the surrounding area, and, upon request, trips can be organised to nearby Lecce with its beautiful historic centre and numerous Baroque-style churches. 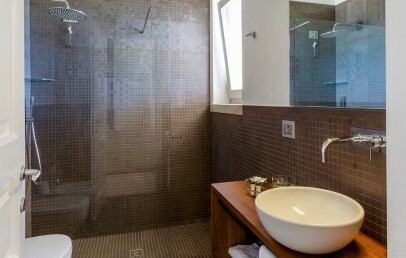 Comfortable and bright double room with bathroom with shower, slippers and complimentary toiletries set. 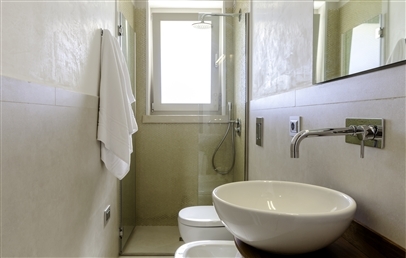 Bright double room with desk, bathroom with shower, slippers and complimentary toiletries set. Outdoor private patio furnished with two chairs, two armchairs, a small round table and a low coffee table. 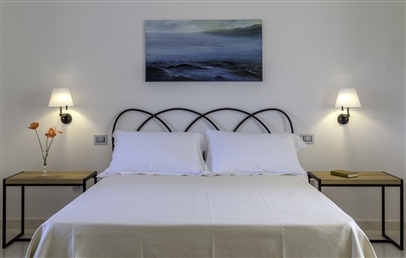 Bright double room with desk, bathroom with shower, slippers and complimentary toiletries set. Outdoor private terrace furnished with two chairs, two armchairs, a small round table and a low coffee table. 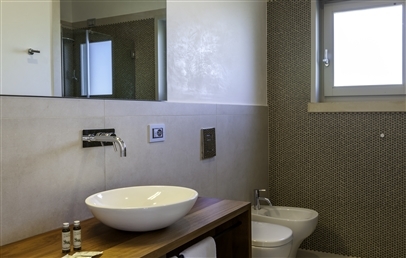 Bright double room decorated in light colours; the room has an en-suite bathroom with shower and complimentary toiletries set. Outdoor private terrace furnished with two chairs, two armchairs, two sun loungers, a small round table and a low coffee table. View over the sea and the pool. Rooms are from recent construction and are located in an independent building. They are comfortable and bright and have a double bed, bathroom with shower, hairdryer, slippers and complimentary toiletries set. The outdoor sitting area is equipped with loung table and chairs and offers garden view. On request this room can be connected by an internal door with the Trullo room and have the patio/garden adjoining. This solution can be booked as Suite Family Garden. 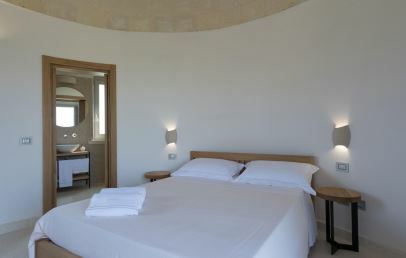 Round surface rooms "Trullo", from recent construction, are located in an independent building. They are comfortable and bright and have a double bed, bathroom with shower, hairdryer, slippers and complimentary toiletries set. The outdoor sitting area is equipped with loung table and chairs and offers garden view. On request this room can be connected by an internal door with the Superior Garden room and have the patio/garden adjoining. This solution can be booked as Suite Family Garden. This accommodation is perfect for a family or a couple of friends, who would like to stay in a more independent area of the Tenuta. 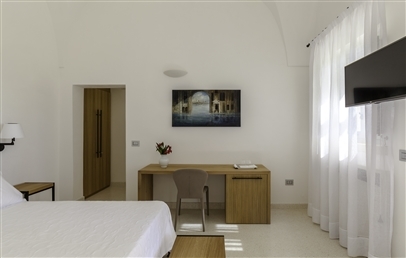 It is a Superior Garden room and a Trullo room, from recent construction, and are located in an independent building. 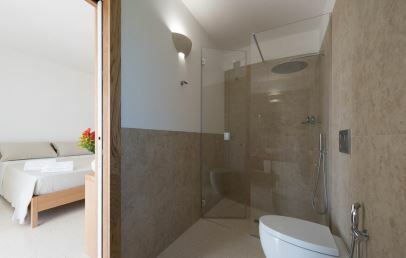 Each room has it's own bathroom with shower and private outdoor sitting area adjoining with garden view.